Against the relentless trend of consolidation of the last few decades you could argue that only one European manufacturer has begun from scratch to claim and maintain a significant position within the European market. The Polish Solaris concern, with its green dachshund emblem, developed out of the Neoplan Polska operation headed by Christof Olszewska who, with his wife Solange, took this on in 1996 and against all the odds has built it up to the point that it delivered 1,302 buses last year, the best total it has yet achieved. This year the figure will be around 1,400 and with further investment in the plant at Bolechowo-Osiedle near Poznan just announced, that capacity is set to grow further. It would not have been possible to achieve this focusing on the relatively small Polish market and from the outset Solaris has been very good at winning export business. The current list of markets it has supplied stands at 28, among them most of the left hand drive European markets as well as Israel and the United Arab Emirates, where a major order was won from Dubai. Significantly, Solaris has proved adept at winning business in Germany, a notoriously difficult thing to achieve profitably and one that few others have managed. 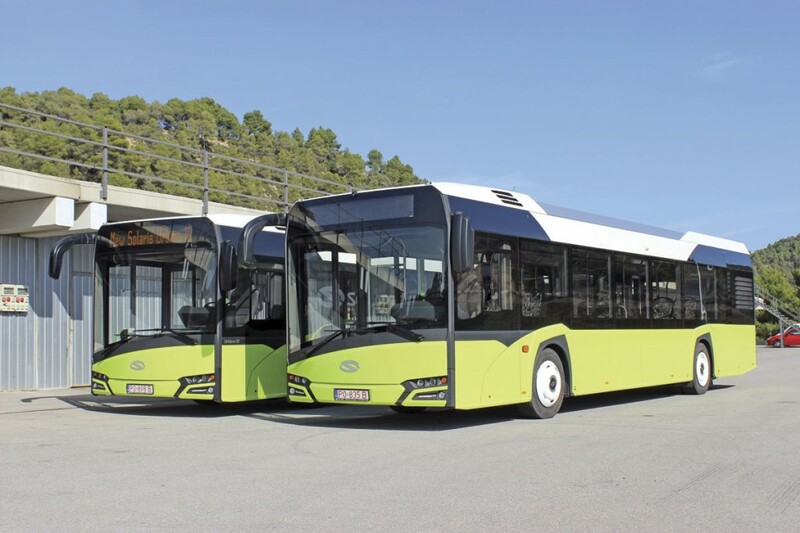 The key Solaris product is the Urbino heavy duty single decker which is offered in a bewildering variety of forms, varying in length from 8.6m to 18.75m. In addition to the length options, there are full low floor, low entry, diesel, hybrid, electric, and CNG variants together with the very successful Trollino range. They even have a tram design. Within each of these areas there are further options: including two different diesel engine makes and a third under consideration; various electric types – plug-in, on-line charging, pantograph, fuel cell range extender and feasibly quick battery exchange; serial and parallel hybrids with Eaton, Skoda, Vossloh Kiepe, Allison EP50 and Voith systems; trolleybuses with electrical systems by the Polish Medcom company, Vossloh Kiepe, Skoda and Cegelec; and CNG from Westport Cummins. 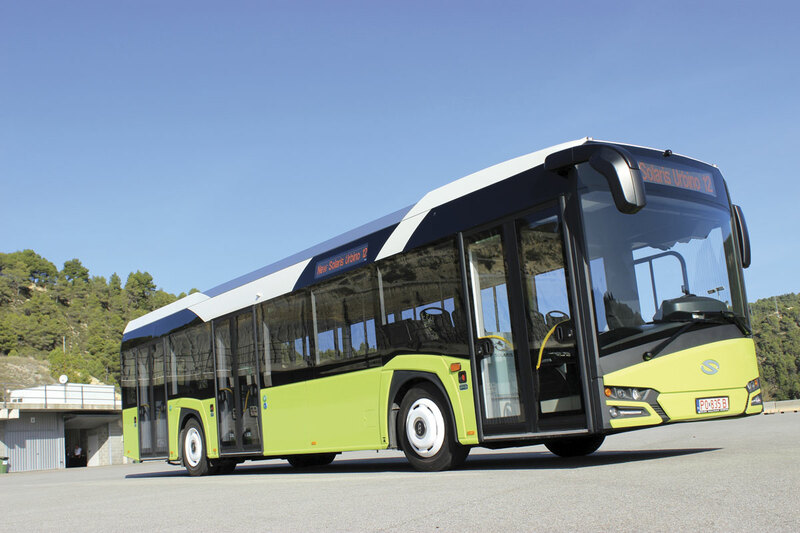 Spearheading the drive to continue growth is a new generation of the Urbino that was unveiled recently at the IAA exhibition in Hanover in 12m and 18m diesel engined form. During October, prior to exhibiting at the FIAA show in Madrid, Solaris invited three groups of journalists from the European press to an event in Sitges, Spain, which gave the opportunity to take a better look at the new Urbino including driving it on the Castelloli test track and on the road. 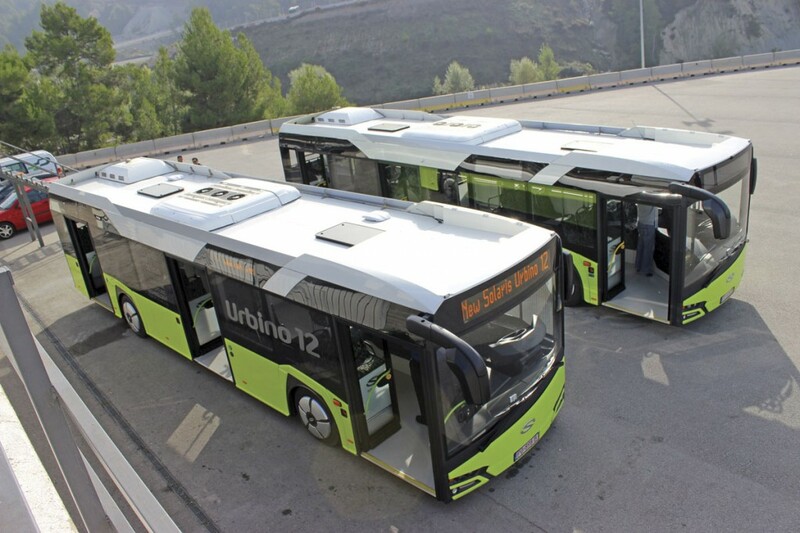 Two pre-production buses were present, both 12m long, diesel powered, three door, Urbino 12 models. The 18m articulated Urbino 18 was precluded from participation because of the logistical requirements attendant to its display at a forthcoming show in Sweden. 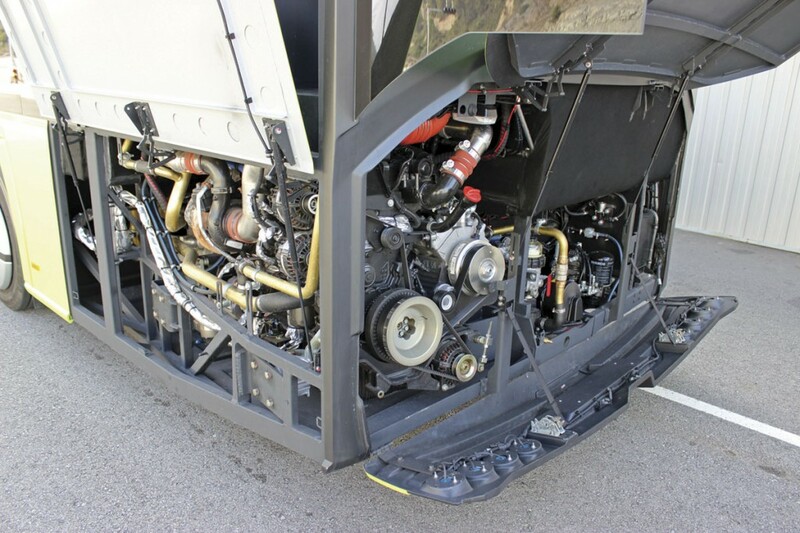 The Urbino 12s featured different engine options in line with the current Solaris philosophy of offering Cummins for use in buses up to and including 12m long and DAF from 12m upwards. One had the 6.7-litre Cummins ISB6-7.6 unit while the other was equipped with the new 10.8-litre DAF/Paccar MX11. The Cummins is available with three outputs: 250hp/187kW, 280hp/209kW (as fitted in the evaluation bus) and 310hp/231kW developing torque of 1,000Nm, 1,100Nm and 1,100Nm at 1,200-1,600rpm (1,200-1,800Nm in 310hp version). DAF’s MX engine features EGR and SCR technology together with a diesel particulate filter and is offered in 290hp/210kW, 330hp/240kW and, as in the demonstration bus, 370hp/271kW versions delivering 1,200Nm/1,400Nm or 1,600Nm respectively at 1,650rpm. Both demonstrators featured Voith DIWA-6 automatic transmissions. 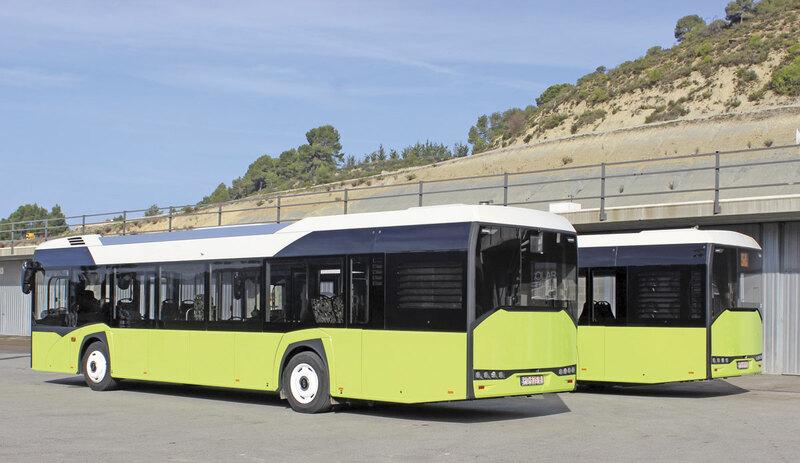 Voith has worked with Solaris since the start of production and provided the transmissions for over 7,000 buses to date. The latest DIWA-6 with Senso-Top shifting technology offers up to 5% lower fuel consumption and emissions. It is less complex and has a new housing and a softer torsional vibration damper designed to reduce vibration and noise. It operates at a lower pressure than previous DIWA generations and has an intelligent start up facility supported by new speed sensors. As on the previous generation Urbino the axles are supplied by ZF. 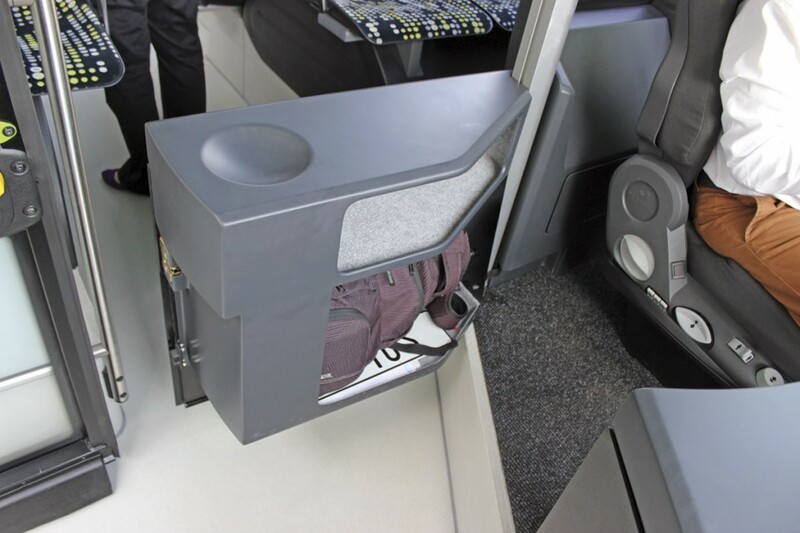 At the front is the RL82EC independent system which is an upgrade from the RL75EC previously offered. Surprisingly, some operators still prefer a rigid front beam and for them there is the RL85 unit. The drive axle remains the ZF AV132. Structurally, the new generation has quite a bit in common with the previous one but with very significant changes that mean it is 720kg lighter, but also stronger. Manufactured in stainless steel, it has a new design of connection between the vertical and horizontal steel pillars. Visually, the roof line incorporates shrouds that disguise the roof mounted equipment and the stylish integration of coloured and dark glass panelling integrates the look well, set off by features mouldings to the wheelarches. The panelling is attached in a new manner, designed to make replacement quicker and easier. 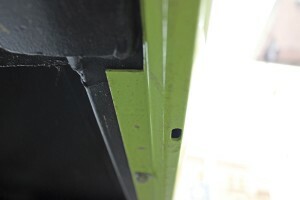 The side panels slot into place and are secured beneath the lower edge by a series of screws. One of my few reservations about the design was the vulnerability to damage of the lip on the lower edge of these panels and the deliberately wide fit gaps between some of the panels, which I thought in some places had the potential to catch cyclist’s clothing. Access for maintenance is assisted by panels that now open to 170 rather than 140 degrees and are therefore also safer. Dimensionally, the 12m length, 2,550mm width and the 5,900mm wheelbase are the same but the overall height has been reduced by 150mm from 3,250mm to 3,100mm without reducing the 2,285mm interior headroom through a new ceiling arrangement. The rear overhang is 3.4m and the front overhang 2.7m. The seated capacity of the three door model remain as before at 32 but the number of seats without pedestals have been increased from ten to 16 by measures including the relocation of the fuel tanks (and with DAF engines the AdBlue tanks) to the front and the uprated front axle. Total passenger capacity is increased by six from 104 to 110 as the overall weight has been reduced from 10,890kg to 10,170kg. At the same time, drive by noise has been reduced from 78.0dBA to 74.8dBA at Euro6. Doors, either by Bode or Ventura, are now wider at 1,250mm, taller at 2,000mm and, unlike the previous generation, the position of the centre door can be moved within the wheelbase. For the driver, the driving position is mounted higher to improve the view and the front screen is also larger, though it retains the characteristic slant to the lower edge which would presumably mean quite significant investment would be required if right hand drive construction were to be contemplated. The cab is spacious with a fully adjustable steering wheel position and major storage space within a solid, and quite heavy, internal cab door that hinges from the rear, blocking the aisle when open. 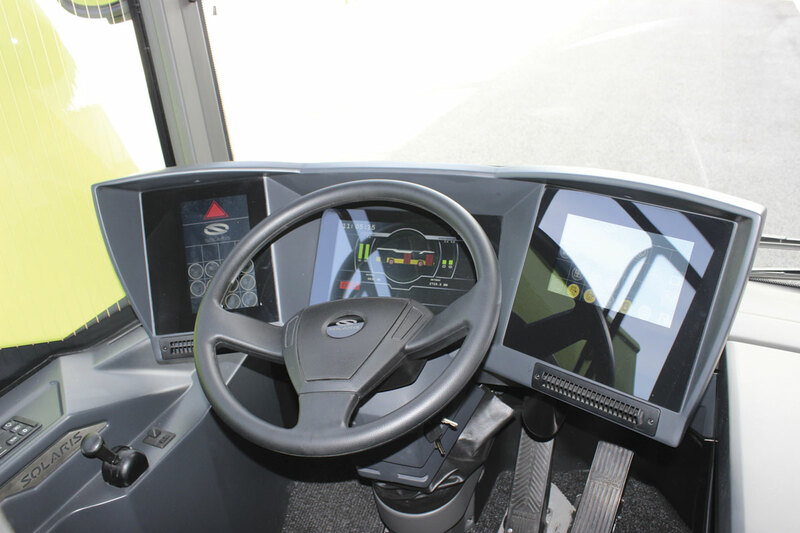 While the DAF powered bus had a conventional dash layout the Cummins engined one featured a new entirely touch screen digital one. Reflections made this very difficult to photograph but it was easy enough to see everything when you were driving. 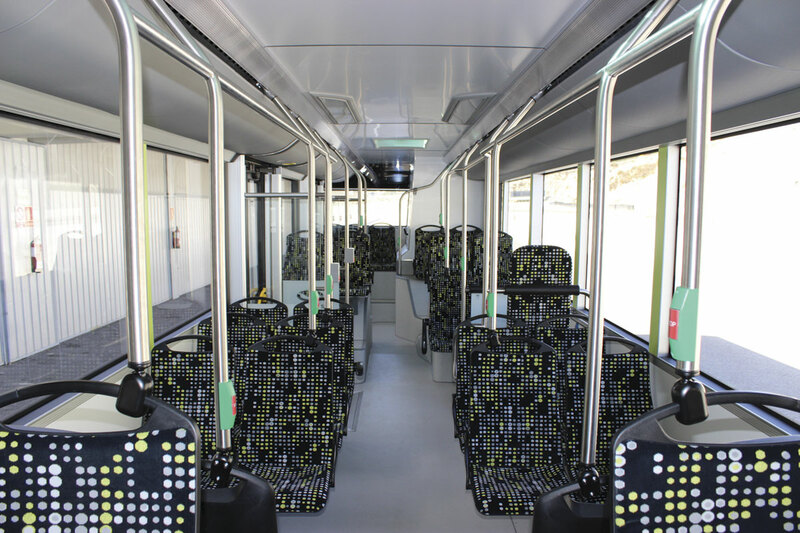 Inside the buses featured stainless steel stanchions, seats by Ster. Both smart in appearance with the use of practical aluminium extrusions, especially around the doors. The look was attractively uncomplicated. Glazed decency screens featured the Solaris emblem in the frosted lower sections though I imagine operators would be able to specify what they wanted in this area. There was one item of trim adrift, above one of the side windows, but fixing it did not appear to be a difficult proposition and it was a pre-production bus. Otherwise everything seemed to be of good quality and well put together. I had not been to the Castelloli facility before and it is surprisingly good for hosting such events with plenty of lengthy gradients and corners that are not too sharp for smooth bus progression. Each lap involves covering over four kilometres. Coupled with this, traffic cone bus stops had been set up at regular intervals to create a more realistic driving experience. Travelling on both buses, they rode well and were stable even when driven more quickly around corners than you would hope would happen in service. At the rear there was more noise from the DAF than from the Cummins, particularly next to the engine ‘cupboard’. The track scenario gave me the opportunity to take the wheel of both vehicles. A good driving position was easy to achieve, I had a clear view through the wheel of the main display and the mirrors had everything covered. The open cab window on the DAF rattled slightly. The steering on both was smooth and responsive. Both felt powerful though with the foot hard down on a steep hill section it was the Cummins that maintained the higher speed. At 50km/h the DAF was indicating just less than 1,200rpm in top. While the DAF braked smoothly at all times, I found it slightly more difficult on the higher revving Cummins to balance the effect of the retarder when braking so that coming to a complete halt couldn’t be felt in the saloon. Others who experienced the same phenomena were shown by the Solaris team how to overcome it, but there was not time for me to take another lap to do so myself. Solaris have yet to supply any buses to the UK, and pressed on the subject of the UK market Martin Gruber would only say, ‘not yet.’ At the IAA a Solaris representative revealed that there had been talks between the company and ADL but there was no indication of the subject and I was led to believe that these discussions were not ongoing. Right hand drive buses have been built in the past; just three of them. These were of the Valetta model, a simplified, lighter weight, version of the Inter Urbino, featuring an Iveco engine. As the name suggests they were supplied to Malta. 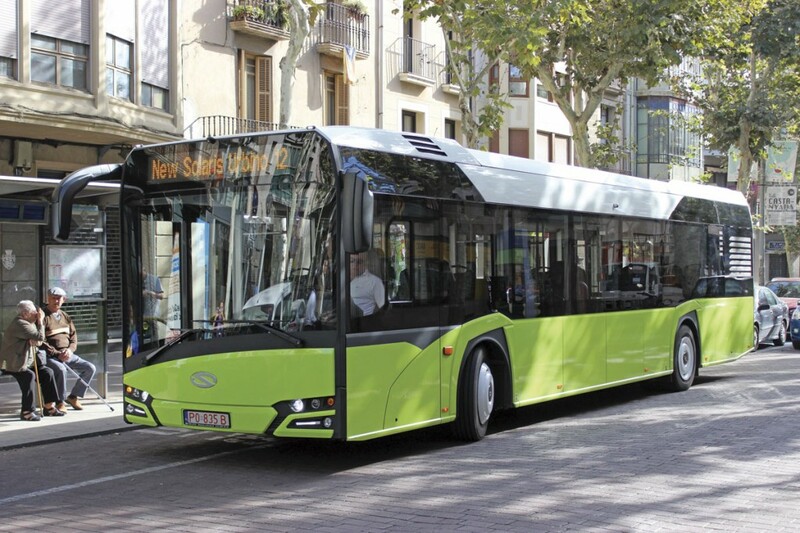 Realistically, for Solaris to tackle the UK market would require a partner to provide support and, at present, its focus on the heavy duty single deck market would leave it competing in a small and oversubscribed sector. 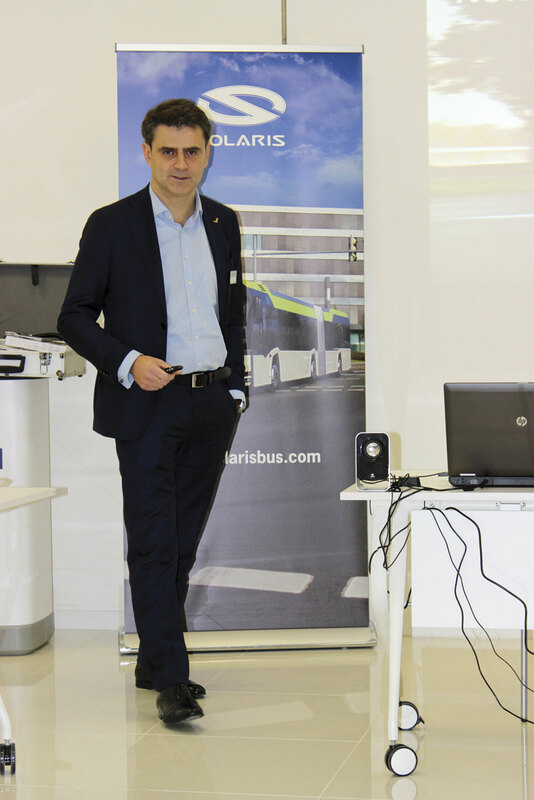 It is always difficult to demonstrate pre-production vehicles and there were some elements of the buses we saw that can be further improved but despite this it was clear that Solaris has put a lot of thought into its new generation and the result can only enhance its opportunities and appeal within the many markets it is present and beyond. Whether that will ever include the UK and Ireland remains to be seen, but with so many models to develop in the new form, talk of an FPT diesel engine option, as well as ambitions for a double articulated Urbino 24, I imagine they have plenty to occupy them for the time being.